The most successful team in the history of Daleville High School is a little off the radar. While the Warhawk football and basketball teams have had their own share of good fortune, more trophies line the hall of the Daleville JROTC building than anywhere else on campus. 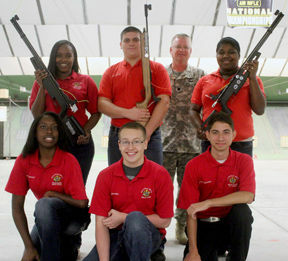 The Daleville JROTC Rifle Team laid claim to two more trophies this summer by taking home a pair of NRA Air Rifle National Championships. The Warhawk Battalion took home the NRA Sporter Position Air Rifle Championship, and team member Alexis Poke captured the NRA 40 Shot Standing, Sporter Air Rifle title. The Rifle Team, which is composed of three juniors and three seniors, brought home the top prize despite some individual shooters from other teams shooting better. Hundreds of schools nationwide compete every year for the right to call themselves national champions. This year wasn’t the first time the Warhawk Battalion tasted the sweetness of victory, as Daleville also won national titles in 2011 and 2012. Team member Jonah Nabinger knew his team was good, but admits that he never expected to win a national championship. The Warhawk Battalion feels a tinge of added pressure every time they compete because the teams that have come before them have been so successful. Poke said other teams take notice whenever the Warhawk Battalion arrives at a competition. Shooting sports closes the gap between athletes. When a shooter toes the line or gets in to a prone position, it doesn’t matter how fast they can run or high they can jump. It all comes down to being mentally strong. Team member Melanie Moody agrees with her coach. Since being formed in 1971, Daleville has won more than two-dozen Alabama State Championships in a variety of rifle events, such as small bore, precision international and sporter. The Warhawk Battalion is currently 2-0 during the fall season.